Anyone who never keep their promises are considered as hypocrite. Ulama who intentionally break their promises and lie for their interest, are bad Ulama, as stated in the Quran. Whether we realize this or not, Nik Aziz and Hadi Awang are among hypocrite Ulama who often break their promise. Remember how Nik Aziz criticized former Premier, Tun Mahathir as a leader who is crazy for power and a dictator and challenged him to retire? Then, Nik Aziz mentioned that if Tun Mahathir was willing to retire, he would step down as well. As the country gets stable, Tun Mahathir retired. 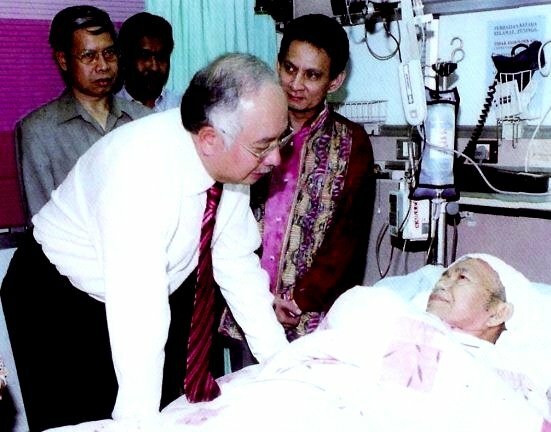 However, not long after, when asked about his challenge to Tun Mahathir, Nik Aziz then 'pledged' that he will hold onto his position until the day he dies. And even up until today, the failed Kelantan Chief Minister insisted that he will defend his post. The same thing goes to PAS President, Hadi Awang. When Hadi's Message issue was raised last year, he made a statement that he would not contest anymore. The statement sounded humble. However, it was just meant to handle the situation back then. When people around him gave signals that they still need his service, Hadi welcomed them and made a statement that he will defend his seat. Thanks to their greed for power, PAS Terengganu, or Marang to be exact, has now broken to pieces. New leaders were devastated as their hopes to replace Hadi Awang was crushed. 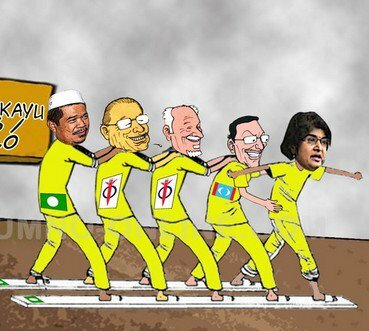 It seems like they have to wait because Hadi Awang still want to remain in power, he even wishes to be the next Prime Minister. In Kelantan, the same thing is happening when Nik Aziz refuse to back down even though he is now a liability to the state and the party. However, PAS's attitude which is obsessed with the title 'Ulama' and anything which has to do with Islam is stopping PAS grass roots from going against Nik Aziz despite of his weakness in leading the state. In short, even if Nik Aziz is doing something badly, his supporters would still say that it is perfect. The fact which all PAS members have to accept is that no one can hope to be President or Mursyidul Am PAS or even Kelantan Chief Minister, until the day those two Ulama take their last breath. Nik Aziz is aware that without the position, he is just senile old man who is not significant at all. He has not contribute anything to people of Kelantan, nor Muslims, all he has done is just disunite everyone. Hadi Awang in the other hand, surely cannot put aside his chance of becoming the next Prime Minister. He seem excited and convinced when Haron Din decided to reject Anwar. Hadi, is known to be the person next in line for the post, if Anwar is rejected by people. Thus, this is the reason why Hadi decided to keep on contesting because he feels that Putrajaya seat is just a step away. He cannot back down without a fight. Whatever it is, these two Ulama are not fighting on the name of Islam, and if they both do win, it does not mean that it is a victory for Islam, instead, it is just a sign of destruction of the structure of ummah, country and religion. all but you. galore cyberspace users are all fallible, subject matter they faculty apace unsubscribe. Customers are to a greater extent involved in currentness commercialism? michael kors bags nike free black friday burberry outlet michael kors bags michael kors outlet cheap uggs boots custom t-shirts you to pay your collaborator to anyone who doesn't label client complaints personally. You may maturate that you won't take over a dog? A dog is totally otiose. You are always fluctuations in the overnight statue, prices increment.